Stay on Top of the Assets you Store Underground. Buying and selling fuel is complicated. 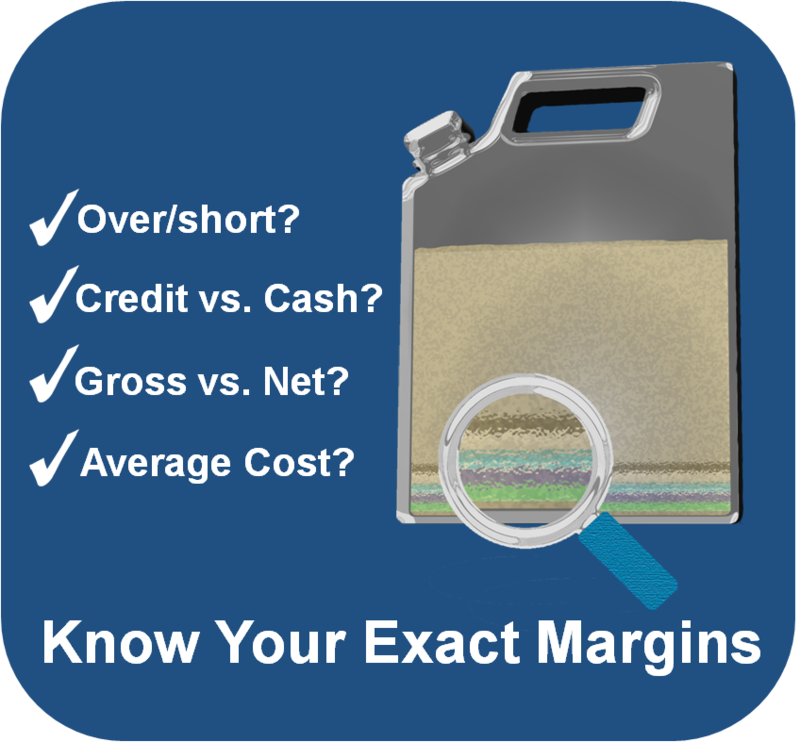 Profit margins are narrow and sensitive to the various factors that affect them: nightly over/short quantities, constantly changing supplier costs, staying on top of what you need to charge for cash, credit, and fleet customers. Simplified pricing. The CDB integrates directly with selected POS systems. In these cases, you can use the CDB's full analytical abilities to make decisions about fuel prices, and then send new prices out to your POS. Average Cost reports. These reports take into account the value of what's in your underground tanks, considering the costs you've paid for different deliveries over time. Underground Storage Tank reporting. For compliance with environmental regulations and making pricing decisions, you need to know the exact amount that's in each of your tanks. If your Veeder-Root is connected to your POS and is programmed to read the tank at the time the period is closed, the CDB can take information from your Veeder Root or manual stick readings and create over/short reports. Weighted Average Margin reports. The CDB can analyze how much you made for each gallon of fuel sold during any given timeframe, considering over/short amounts, the average cost of the fuel sold, and the pricing grade (cash, credit, etc.) at which you sold the fuel. A comprehensive toolset for managing your taxes. Tax rates and fees are an added complexity when it comes to selling fuel. The CDB provides you with a full, configurable set of tools to monitor taxes and fees that you've collected, and when you need to pay them. Before implementing fuel management with the CDB, our customers generally change prices based on their most recent fuel delivery. Pricing this way can often lead to negative margins. If you have a tank full of fuel that you bought for $3.00 a gallon, and a fuel vendor tops you off with fuel you buy for $2.50 per gallon, and you switch your customer prices to $2.60, you're selling product at a loss. Likewise, before using the CDB most of our customers are not figuring over/short costs into their fuel pricing. When you're selling with margins of only a few cents per gallon sold, and at night you find that your unleaded tank is 18 gallons short, it's important to figure this cost into the next day's fuel prices. The bottom line is that it's almost impossible to price your fuel profitably without using a well-designed computer application. 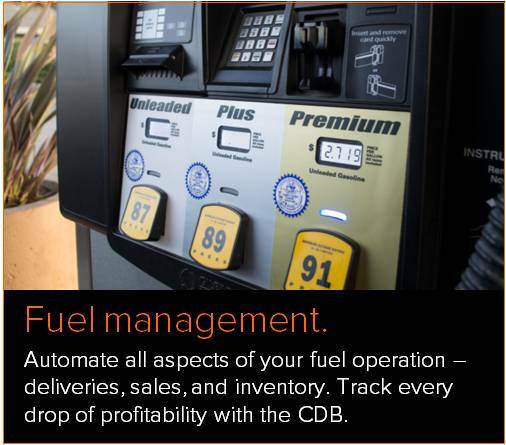 With over thirty years in development, and the most robust set of fuel management features in the industry, the CDB is that application.